Rue du Rhône 114 - CH-1204 Geneva - T: +41 22 849 6000 - F: +41 22 849 6001 - www.ecma-international.org 1 Ecma TC32-PNF From Personal Area Networks to. 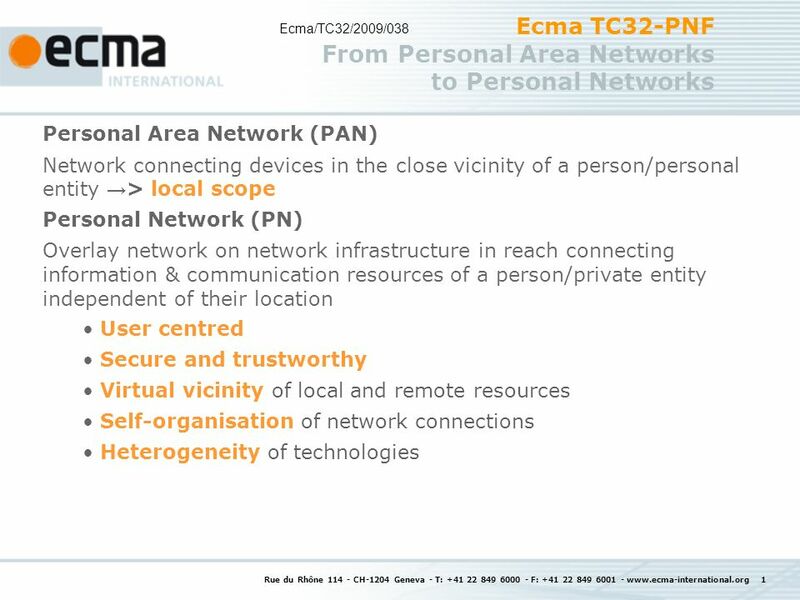 Download ppt "Rue du Rhône 114 - CH-1204 Geneva - T: +41 22 849 6000 - F: +41 22 849 6001 - www.ecma-international.org 1 Ecma TC32-PNF From Personal Area Networks to." Electric Induction Wireless Commumication Invitation to JTC 1/SC 06 for open review For Ecmas prospective comments and dispositions to the DIS in ISO/IEC. Protocol arrangement Slides Ecma/TC47/2012/056 (supersedes 2010/016-Rev1) TC47. 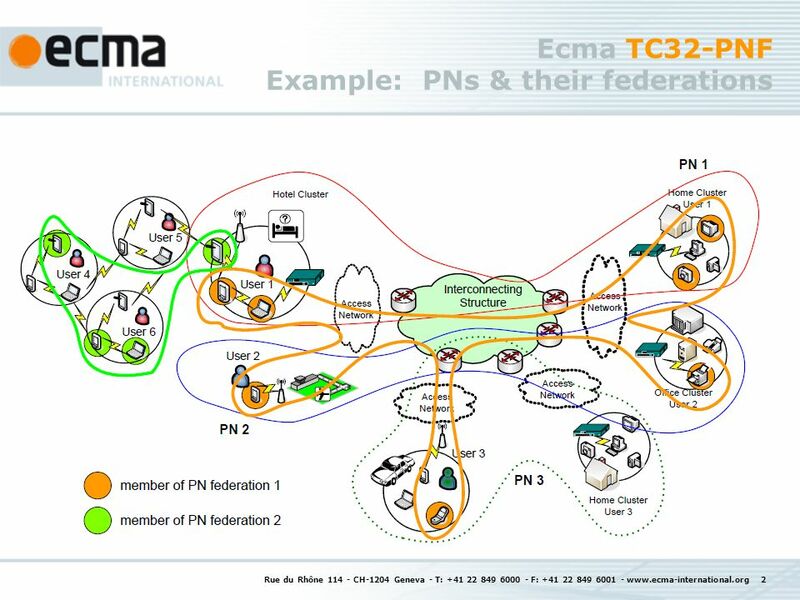 Protocol arrangement Slides Ecma/TC47/2009/070 TC47. Rue du Rhône CH-1204 Geneva - T: F: NFC protocol arrangement ISO/IEC ECMA-352. Expanding LTE for Devices European Commission Information Society and Media The aim of EXATED is to realise the vision of a new scalable. Rue du Rhône 114- CH-1204 Geneva - T: F: Standards for VoIP in the Enterprise By: John Elwell. High Rate - Ultra Wide Band (UWB) Background Ecma/GA/2005/038. Rue du Rhône CH-1204 Geneva - T: F: Safety of Electronic Equipment Safeguards to reduce. Rue du Rhône 114- CH-1204 Geneva - T: F: Ecma TC38 – TG2 May 2007 Kevin Fisher – Intel Corp.
Rue du Rhône CH-1204 Geneva - T: F: HOLOGRAPHIC INFORMATION STORAGE The Challenge. 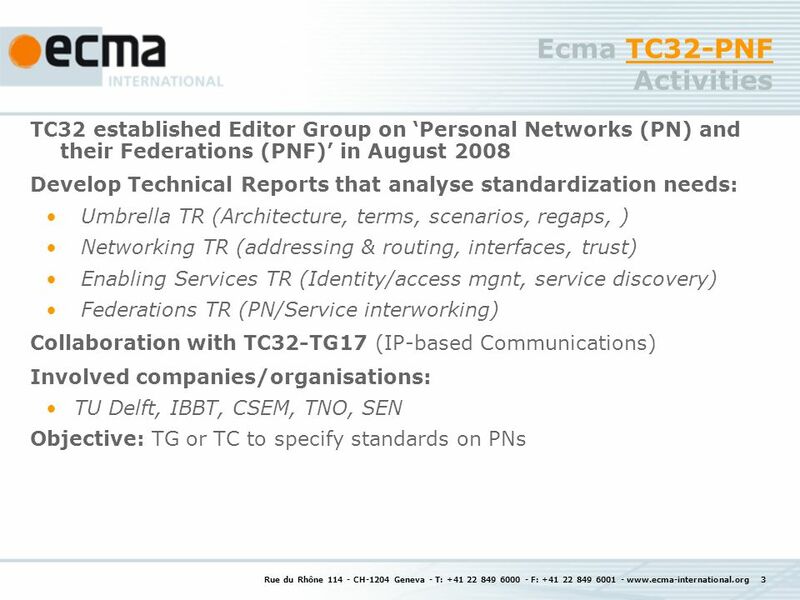 Personal Networks and Their Federations Bernard Hammer TC32 chair Ecma/GA/2008/243. Rue du Rhône 114- CH-1204 Geneva - T: F: Declaration of Environmental Product Attributes. ECMA-370 TED A worldwide standard providing objective, comparable, product environmental information for ICT & CE products. Silvio Weeren (IBM, Ecma TC38.